You can create your own meme by going to the BeThe1To site. Suicide Prevention Month happens each September. But that’s not the only time to remember how much we can do to help folks who are at risk of suicide—we can take action at any time. 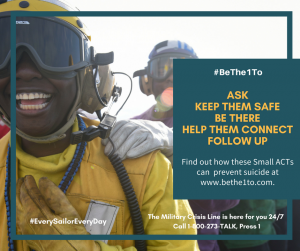 “#BeThe1To” is the National Suicide Prevention Lifeline’s social-media message for National Suicide Prevention Month and beyond. It’s intended to spread the word about actions anyone can take to prevent suicide. The organization is working to change the conversation from suicide itself to the prevention of suicide—to actions that can promote healing, help people at risk, and give them hope. Ask: Asking the question, “Are you thinking about suicide” lets a person known that you are open to talking about this difficult subject in a non-judgmental and supportive way. Other questions to ask: “How do you hurt?” “How can I help?” After asking, make sure to listen. Keep them safe: If the person indicates they’re thinking about suicide, it’s important to find out some things to establish immediate safety: have they already done anything to try to hurt themselves before talking with you? Does the person have specific ideas of how they would go about it or a detailed plan? The more steps and specifics in their plans, the greater their risk. It’s especially important to find out if they have access to a gun and, if so, putting distance between them and that gun by calling authorities or driving them to an emergency department. The myth “If someone really wants to kill themselves, they’ll find a way to do it” often does not hold true if appropriate safety measures are put into place. Be there: Staying in contact with someone who is at risk lets them know that you mean it when you indicate your support for them. Therefore, it’s important not to promise to do anything you cannot or are not willing to do. If you can’t be physically present with them, talk with them to help them figure out who might be able to. 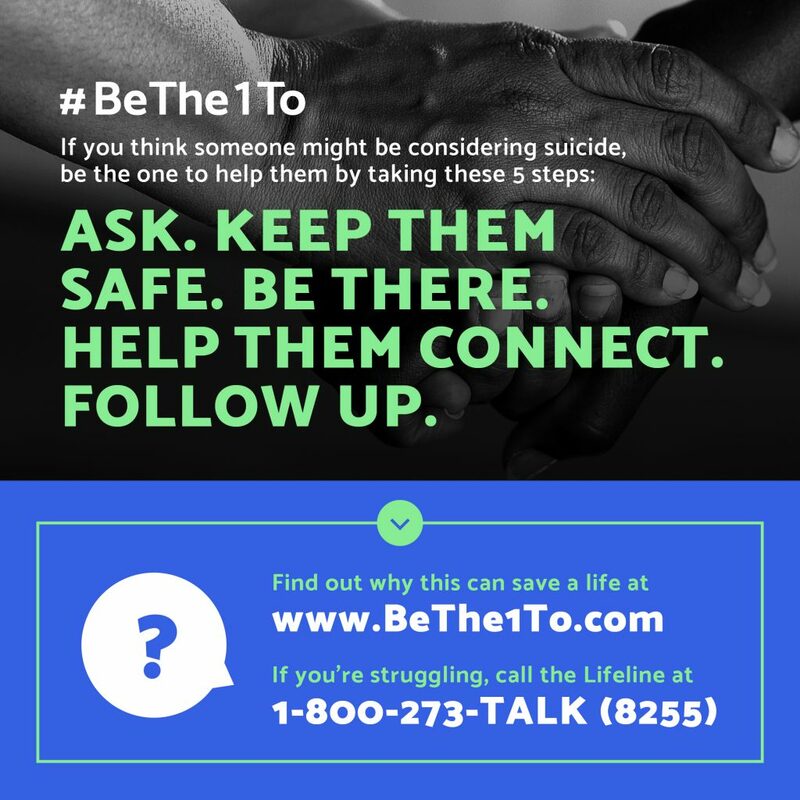 Help them connect: According to the Centers for Disease Control, helping a person become more connected to others can help protect against suicide. This is often called a “safety net.” The National Suicide Prevention Lifeline (800-273-8255) is only one way to connect; it’s also important to help connect them with supports and resources where they live, such as therapists, psychiatrists, doctors, and other community resources. Also, the My3App is a smartphone app that lets people stay connected when they are having suicidal thoughts. Follow up: After you’ve had a conversation with someone in which they’ve admitted that they’re thinking about suicide, it’s important not to just let that conversation fall through the cracks. See how they’re doing: leave a message, send a text, give a call. Studies have shown reduced numbers of deaths by suicide when following up was involved. 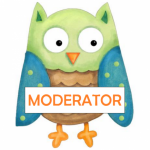 What kinds of conversations have you had, either with someone who was struggling with suicidal thoughts, or with someone who was trying to help you with thoughts of your own? What makes it difficult—or easier—for you to talk about this subject with others? Share your ideas in the comments! This is one of the memes created by the U.S. Navy. Who sees what you post?